I wanted to share this post from Harvard Business Review, written by Tim Riesterer. What initially “engaged” me was a great headline: Stimulate Your Customer’s Lizard Brain to Make a Sale. Points for Tim; the title stopped me immediately. It made me act. Just like Tim intended. “The lizard brain” is a phrase first introduced to me by Seth Godin who defines it as “hungry, scared, angry, and horny.” It is primal. It cares what everyone else thinks and is the source of resistance to change. It is our autopilot, its sole purpose is to survive and it embraces status quo. The lizard brain is afraid of change; change is not safe. The core premise of Riesterer’s message is that to be successful, marketing and sales must overcome a prospect’s primal resistance to change, but that most focus on the wrong message. Any message designed to change behavior must create a compelling sense of urgency. It must change the perception of the survival instinct, to convince it that change is now safer than the status quo. The Sales Benchmark Index – “nearly 60% of qualified leads fall victim to the status quo.” While most marketers and salespeople believe they are selling against the competition, they fail to see the most important competitor – the status quo. Executives want vendors to tell them something they don’t already know about a problem or opportunity. Instead, most only talk about themselves. In complex B2B marketing and sales, decision makers need companies to be consultative. Vendors who provide experience, vision, and insight into increasingly complex business challenges are the ones that offer true value to the role of any decision maker. The tendency of companies to talk mostly about themselves is a messaging problem pervasive in B2B marketing. For internal marketing groups in particular, it is safe lizard brain behavior. After all, every organization embraces the message about how well their solutions perform. Drink the Kool-Aid, share the Kool-Aid. The digital world is in hyper-drive competing for our attention. Messaging must instantly capture attention and hold it. Which means the message must have meaning and context for your target audience. Know them; speak to their business needs in their terms. Create urgency and communicate a vision for change and proof points that trump the evil status quo. Don’t get me wrong; status quo can be a great thing. My wife, my kids and my friends – those are the parts of status quo that I wish I could preserve in perpetuity. In business, marketing and sales, status quo is dangerous. As a marketer and content strategist, I hate “status quo.” It is lethal. Please share your own thoughts and experiences. I’d like to be able to claim that I coined the phrase “Content Engineering.” I can’t. I do find myself using it a lot lately though. I don’t know where I first saw it or I would give credit where it is due. Curious by nature, I googled it the other day and was surprised by the number of results. Wikipedia defines content engineering as “a term applied to an engineering specialty dealing with the issues around the use of content in computer-facilitated environments.” Not exactly consistent with how I’m using the term. Another listing (Brockmann & Company) defines it as the discipline of developing content that greatly improves the rankings of the target site and thereby returns a higher result. Still a fairly technical, application based definition. The best one I found was from Content Marketing Institute which defined the term in an article titled “A New Breed? 7 Roles of the Content Marketing “Engineer” which defines the content engineer as “a marketer who creates and optimizes the many forms of content required to engage social customers, based on the data presented by available analysis tools.” Since the query returned a result of about 1,020,000,000, I stopped there. I’m not that curious, but none of what I did review matched my current interpretation. So how do I define it? Content Engineering is a strategic collaborative approach to marketing content creation that considers the goals of the message, the channels and media options available for publishing and distribution. Content is designed to fulfill a varied set of communication requirements and objectives, audience targets, media choices, scope, calls to action, scalability and potential delivery mechanisms. It is an orchestrated process that occurs over time. Minimal waste, no duplication of effort, not one and done but a content opera which is measured for effectiveness and refinement. Content marketing is relatively new and evolving. I’ll probably be curious enough to return to my definition soon to see if it still fits. I’m sure it will likewise evolve. 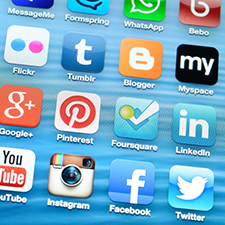 Who should own Social Media – Communications or Marketing? How has digital communications and social media changed your approach to content and marketing? Remember this early debate when social media first emerged as a B2B marketing channel? Since appearing on marketing’s radar, the question of who should ‘own’ social media within the business has echoed across small and large enterprises everywhere. Here is my take – It is the wrong question. The correct question is this. How should enterprise marketing structures, strategies and processes adapt to the content demands of social media and new rules for audience engagement, enabled by ubiquitous information and all things digital – the web, social media, search engines, etc? Traditional marketing structures of most enterprises today are outdated. They evolved to meet traditional marketing media. Now they must evolve again to address the new rules of inbound and outbound marketing, press and analyst behaviors, customer expectations and most of all, shifting buy cycle trends. Here’s why. Communications (PR, Analyst relations, media relations). The term mar-com took root and the web didn’t exist. Customer awareness was delivered in the form of advertising; information was the role of collateral, trade press and particularly sales, touching customers early in the buying cycle. Communications handled press and analyst activities by phone, snail mail, PR newswires, and in person. Personal relationships were as important to press and media people as they were to sales. Content was important, dominated by collateral and press releases, perhaps an occasional advertorial. Deeper content produced separately by product management came in the form of manuals and user guides, training educated sales and supported customer product knowledge, all often developed outside of marketing’s view. Compare that to the digital world we live in today. The web provides people with access to ubiquitous information in almost any form. Customers expect it. It’s no longer about finding customers but making sure customers find you. Customers are now controlling the conversation via the web and social media, and sales touches the customer much later in the buying cycle. Why? Because buyers don’t need to rely on a salesperson for information as they once did. In fact most buyers don’t even want to talk to sales until they’ve already researched and made numerous decisions about what solution provider is likely to meet their needs. So what does this mean for today’s marketing teams? It is now the customer’s expectation (and marketing’s responsibility) to produce much greater volumes of content. Content to address a wider audience, in many additional forms and optimized for search to compete with hundreds of thousands of competing information resources. This is the evolution of what is known today as “Content Marketing”. And, we haven’t even begun yet the discussion of social media and how that can be executed by the business, except by inference as it is directly connected. Call it the perfect storm. On one hand we have much greater demand for content and information enabled by the web and expected by customers. On the other hand, few marketing organizations have seen a corresponding increase in resources to satisfy the insatiable demand. In fact, the recession has reduced most marketing budgets and resources. Why is the debate about who should own Social Media the wrong question? Because without re-evaluating what we consider to be content, how we produce it, manage it, and scale it, enterprise marketing and communications cannot meet the demands social media and other digital channels present to create a successful marketing engagement, and still fulfill the current definitions of their day jobs. The answer to the original question? We all must own it. So how does business organize to support it strategically and tactically?